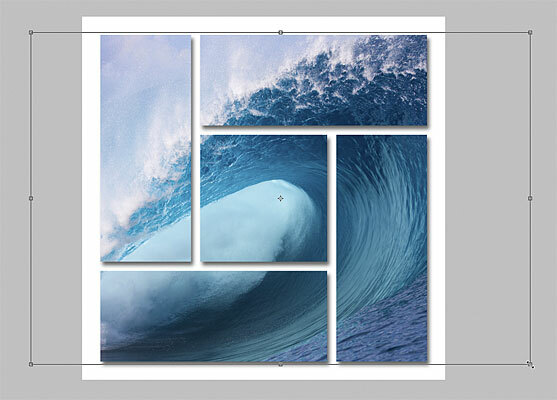 In this Photoshop tutorial, we'll learn how to display a single photo as a cluster of shapes, similar to larger "wall cluster" displays where several photos, usually in different frame shapes and sizes, are arranged together on a wall to form a larger design. In this case, we'll use Photoshop to create something similar but on a smaller scale using just a single image. 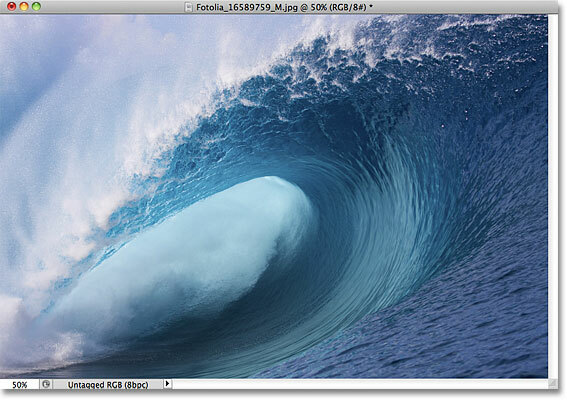 Set the Width and Height to 1000 pixels, the Resolution to 72 pixels/inch, and the Background Contents to White. On a PC, the Preferences are found under the Edit menu. On a Mac, they're under the Photoshop menu. Set Gridline Every to 2.5 percent in the Grid section. The document with the grid turned on. Photoshop adds a new layer and names it "Layer 1". 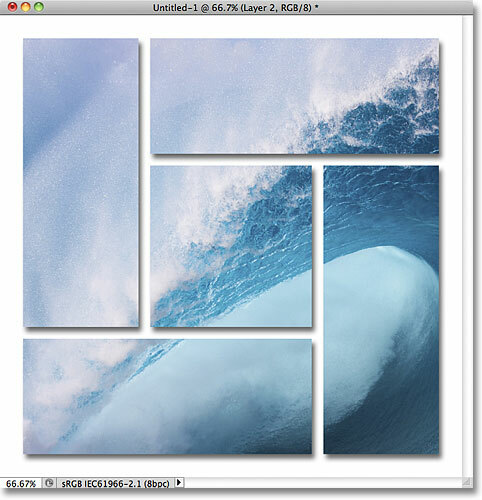 Draw a selection outline around the grid, leaving a border two squares thick around the edges. Go to Select > Deselect to remove the selection outline from around the black-filled area. Draw a selection around the 11th column of squares from the left, leaving 10 squares at the bottom unselected. Hold Shift and draw a selection around the 11th row of squares from the bottom, leaving 10 squares on the right unselected. Again hold Shift and draw a selection around the 11th column of squares from the right, leaving 10 squares from the top unselected. Hold Shift and draw a selection around the 11th row of squares from the top, leaving 10 squares on the left unselected. The initial larger shape has been divided into five smaller shapes. The image after adding the drop shadow. Photoshop places the image on its own layer above the shapes layer. The effect after clipping the photo to the shapes. Photoshop indents layers that are clipped to the layer below them. Go to View > Fit on Screen. Resize and reposition the image inside the shapes as needed. And there we have it! 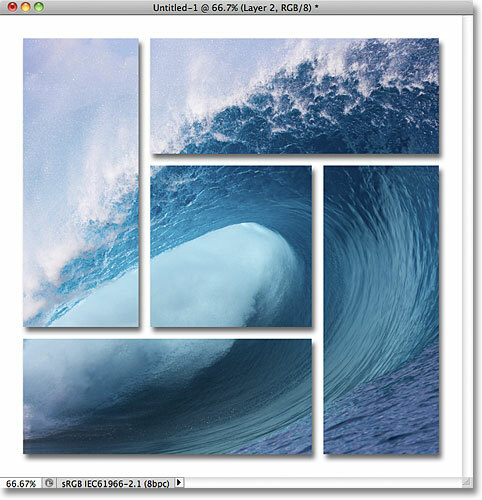 That's how to create a shape cluster display from a single image with Photoshop! Visit our Photo Effects section for more Photoshop effects tutorials!